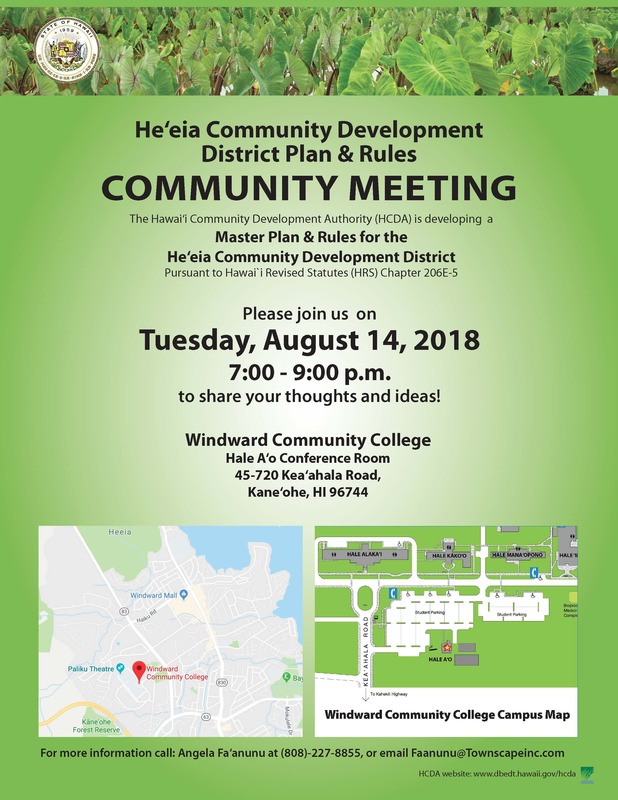 Was held on August 14, 2018 at 7 p.m.
Project Description: The Heeia Community Development District (CDD) Plan and Rules will be the long-range community development plan for 405 acres of land designated in 2011 as the Heeia CDD. Pursuant to Hawaii Revised Statutes (HRS) Chapter 206E-5, Designation of community development districts, community development plans, the HCDA is required to develop a community development plan for the Heeia CDD. The document will be in conformance with HRS Chapter 206E-5, Chapter 91, and key policies adopted by the Hawaii State Legislature, to be approved by the HCDA Board. The Plan and Rules will address culturally appropriate agriculture, education, natural resources restoration and management of the Heeia wetlands. 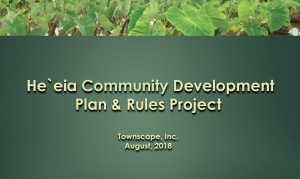 The HCDA contracted Townscape, Inc. as the consultant to develop the Heeia CDD Plan and Rules. Background: In 1991, the HCDA acquired the 405 acres of land as part of a land exchange with Bishop Estate. On January 1, 2010, Kakoo Oiwi and the HCDA entered into a 38-year lease agreement. 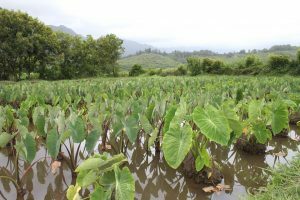 In August 2010, Kakoo Oiwi adopted a strategic plan to restore 305 acres of fallow land into agriculture, including kalo, dryland food crops, freshwater fishponds, and other culturally significant plants within the wetland area. Approximately 100 acres of uplands would be restored to native forest and orchards. On July 8, 2011, Act 210 was signed into law creating the Heeia CDD. The HCDA was designated as the local redevelopment authority of the district to facilitate culturally appropriate uses of the Heeia wetlands.